Public art in the courthouse that once stood on the site of Federal Plaza in the LOOP featured a mural depicting the Athenian philosopher Socrates (469-399 BC). 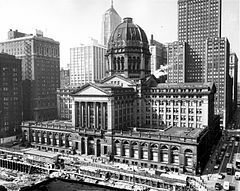 The Old Federal Building on this site was a massive neoclassical gem constructed between 1898 and 1905 to house courtrooms, offices of federal agencies and a postal facility. The interior included a spectacular rotunda larger than the one in the United States Capital Building in Washington D.C. Murals depicting the history of the rule of law and justice painted by William B. van Ingen were added to the courtrooms in 1909. They were all lost when the old building was unceremoniously demolished in 1965. Illustrated title for the June 12, 1909 Harper’s Weekly article about van Ingen’s murals in the Chicago Federal Building. The illustration reproduces a courtroom mural featuring Socrates. The title occupies space filled with an inscription in the courtroom mural. One courtroom mural was on Socrates. We have a record of its composition because it caught the attention of Charles de Kay, an art critic for Harper’s Weekly. The composition places Socrates with his back to the viewer at the far right in a manner that invites the viewer to assume his role in the conversation. The other men listen intently. Van Ingen seems to conjure Socrates as we find him in Plato’s Republic — a calm, rational thinking person focused on the investigation at hand — and not necessarily the nonconformist intellectual both admired and lampooned by his contemporaries and who was tried, convicted and sentenced to death by a democratic jury. 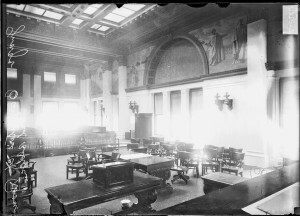 Van Ingen intended his “Socrates Discoursing about Justice” to be installed in a particular courtroom– that of Kenesaw Mountain Landis, the jurist who in 1907 had, in this very building, presided over the celebrated anti-trust suit against Standard Oil of Indiana that fined the company over $29 million for taking rebates from railways shipping companies in violation of federal law. The fine was overturned on appeal the following year but Landis had secured a reputation for standing up to big business and powerful authorities. Perhaps the painter found Socrates a good subject for Landis’ Chicago courtroom because he was a historical figure known for both rational thought and risk-taking perseverance against established powers. Perhaps to the painter Judge Landis seemed a Socratic gadfly willing to stir things up. If so, the Judge Landis had other ideas. He objected to the painter’s desire to place the Socrates mural in his courtroom. He wanted van Ingen’s depiction of Lincoln instead — and got his wish. Read more about William B. van Ingen who is best known for spectacular murals depicting the construction of the Panama Canal installed in the Adminstration Building in Panama as well as contributions to the decoration of the Library of Congress. Read more about Judge Kenesaw Mountain Landis who went on to become the first Commissioner of Baseball in the wake of the Black Sox scandal of 1920. 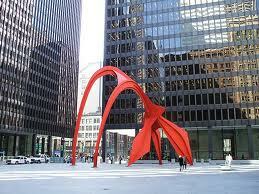 See another photograph of the old Chicago Federal Building.